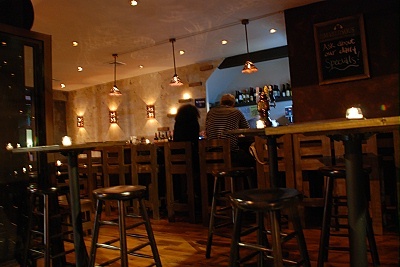 A bar and restaurant, Aqui Se Monstruos serves Mexican food as well as has quite a sizeable bar. Their tequila is quite fantastic. Smaller than businesses that are more central in LA, Aqui se Monstruos is still sizeable for its location. The entrance is a small square room hardly big enough to allow two people to stand abreast inside it, and decorated with an Old Mexico sort of motif. At the opposite side of the entrance room is a pair of old-style swinging saloon doors polished dark along the tops and seams from the passing of many hands. Inside the cantina, the atmosphere is close and quiet. The lighting is low and muted, and the chatter of drinkers is supplemented with quietly playing Mariachi music (and on special occasions, a live Mariachi band can be found wandering around). The bar is small, but long enough to accommodate most of its usual patrons. Only when it gets really crowded do the tables and chairs pushed up against the walls come into use. Drinks here are of a classical Mexican sort: there is plenty of tequila. The restaurant portion of the business is separated from the bar by an open doorway at the far end. It's small and the largest table seats a party of eight, however the food is sinfully good and has an excellent reputation. It's all Mexican here, but rumor has it that the Southwest-style burger and fries are to die for. As for the place's name, well, it's up to customers to decide whether or not there are monsters here. A history of the establishment. It can be as long or as short as you like.